Die Knight Templar Priest sind ein Ritterorden, der insgesamt 3 Grade umfasst, die allerdings nicht einzeln bearbeitet werden. 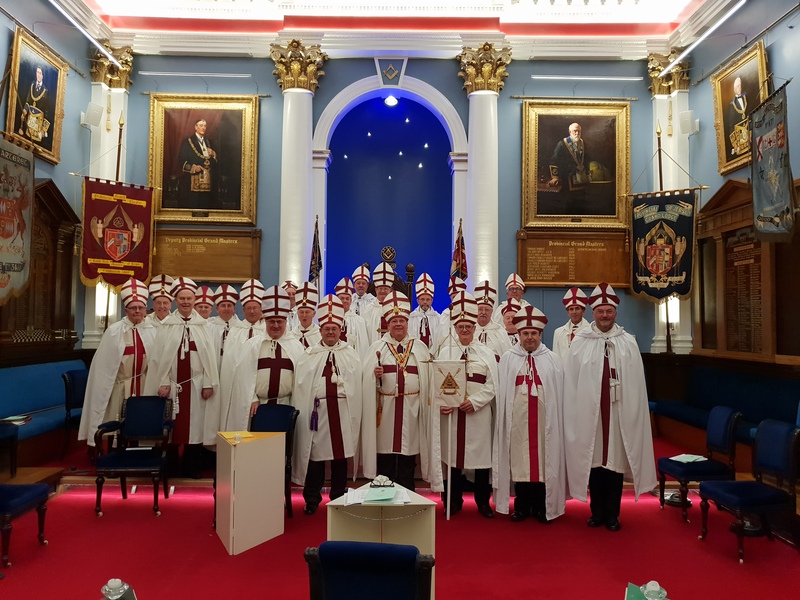 In the early days it was also known as the Priestly Order and was referred to within the ceremonies of The High Knights Templar in Ireland in 1755. The Order first saw the light of day in Scotland in 1800 in Kilmarnock and then extended to Glasgow and Edinburgh. In 1807, the Early Grand Conclave of Scotland issued a warrant to Joppa Encampment of Knights Templar in Sunderland with authority to work a number of degrees including Knight Templar Priest. In 1812 members at Newcastle upon Tyne petitioned the Grand Conclave of England for a Warrant. This was granted in the name of Royal Kent Encampment. Evidence exists of its being worked in the late 18th and early 19th Centuries in England, Scotland, Ireland, Corfu, France and probably the United States and Canada. The Order then became moribund in the 1890s, the last known working being in Lancashire. Prior to 1894, The Order of Knight Templar Priest traced its origins back to the Anahilt Union Band in County Down, Ireland, in 1792. Over 60 Union Bands have been traced in Ireland with only a small number being under the Irish Early Grand Encampment and even fewer being banded with one or more Lodges. During this period there was no ruling body. On Good Friday, 23 March 1894, Henry Hotham, a Yorkshireman and prominent Mason, was apparently the last known Knight Templar Priest. Being the last Installed Master or High Priest, he admitted nine Knights into the Order (under the authority of one of the Original Rules of the Order). The revived Tabernacle being conscious of the efforts of the Council of Allied Masonic Degrees in London to found a Grand Council of Rites agreed that, with its then 24 Appendant Degrees, to become the Royal Kent Tabernacle Time Immemorial. As a consequence the first of the modern Tabernacles, Royal Kent T.I., was formed. After a short period of control by the Grand Council of the Allied Masonic Degrees and, by mutual consent, it separated and became The Grand College. The development of the Order was very slow at first but it soon began to take on its now extensive international form, with the first four New Zealand Tabernacles being between 1930 and 1944 and Australia joining in 1949. Progress of the Order continued very slowly but steadily from 1951 for the next 10 years, but, in the early 1960s, under dynamic new leadership, the pace of expansion increased, and has continued to this day, with the number of Tabernacles now at 251, and on each continent of the World, including England, Scotland, Wales, New Zealand, Australia, Hong Kong, Canada, South Africa, The Bahamas, Holland, Germany, Jamaica, Singapore, Malaysia, Brazil, Spain, Togo, Bolivia and Ivory Coast. It is sad that there are none in Ireland, where the Order is considered to have originated. The New Grand Body had its first meeting on 15 May 1924 at Newcastle upon Tyne. Diese Seite wurde bisher 228-mal abgerufen. Diese Seite wurde zuletzt am 25. März 2019 um 15:53 Uhr geändert.